This outfit will fondly be remembered as one of the last days I was able to step outside without having to put on my jacket. It is near that time of the season when I feel the need to say good-bye to minimal layers and hello to scarves, boot socks and chunky knits. I’m not complaining or anything, I mean we did gain a whole hour of extra sleep time this weekend, but sometimes it is nice to be able to put little thought into how I am going to style an outfit. Trust me, wracking my brain trying to figure out how that cozy, chunky knit is going to fit underneath my wool coat is a terrible challenge. While I look for the key to figuring that out, here is an outfit with minimal layering for the warmer fall days. 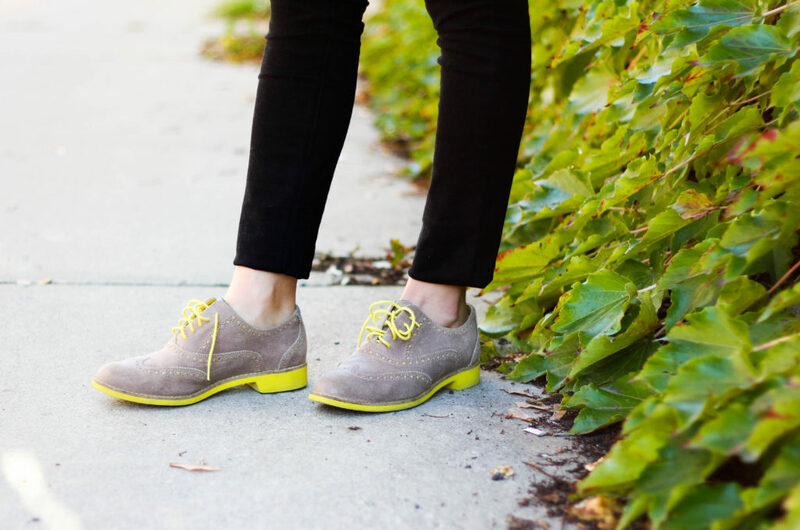 It’s care free and fun, especially my favourite oxford’s that have a pop of neon, keeping the look (and myself) feeling bright, even on those gloomy fall days.